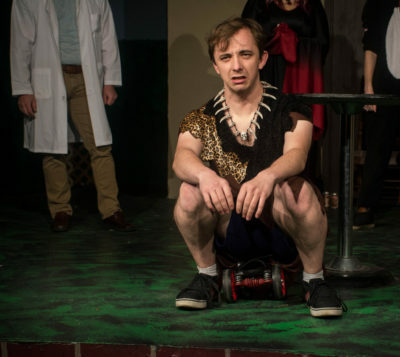 Chimera Theatre and The Freudian Slips shocked audiences last week with wildly inappropriate comedy that left the entire room in stitches. Friday, Oct. 13, evening’s host Andrew G. Cooper opened the show dressed as Freud in a slip, giving the audience a taste of the shenanigans that was to come. In suit top and silky undergarment, Cooper introduced the actors for the night, which included TRU student Jeff Daniels. Starting off the show with a warm up game called Props, Cooper placed a random object on a table and gave the cast complete freedom in antics. Their humor was short but came with a punch that created an eruption of audience laughter. With Friday’s theme of Trick or Treat, audience members were encouraged to dress up. Vying for a chance to win free tickets for their next show, amongst the viewers was a broken doll, Sully from Monsters Inc., a witch and a strip of bacon. The winner was determined by audience Clap-O-Meter midway through the performance. The audience was loud and enthusiastic for all the costumed hopefuls. Ultimately, it came down to a witch and Pinocchio, with the Italian liar taking home the tickets. The overall motto of the Slips is that the cast and audience really have no idea what’s going to happen. 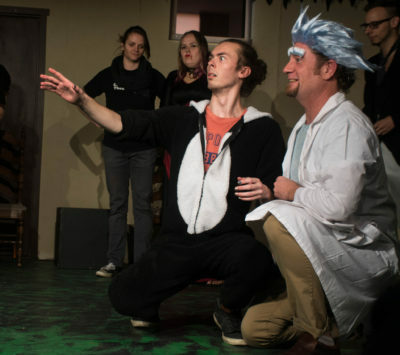 For approximately half the evening, the audience was in control of the subject; a location or character, which allowed the cast to demonstrate the true gem of improv in action. The atmosphere of the theatre was light and generally happy. There was comedy for everyone’s sense of humor; a taste of sarcasm, pop culture, physical comedy and dark humour. Nothing was off the table and it showed. The Freudian Slips were insanely funny and left the audience with sore faces and six packs from constant laughter. This small improv troupe packed a two hour show with hilarious antics and an audience wanting more.